Students seeking admission to AICTE approved Under Graduate (UG) Course in Hotel Management in the State of West Bengal for the academic year 2019-20 have to appear in this state level Joint Entrance Examination. Candidates can see more information regarding How to Apply, Important Dates and various other important information on the page below. For 2019–20 academic sessions, the Board will conduct common entrance examination titled JEHOM-2019 for admission into full time Bachelor’s Degree in Hotel Management and Catering Technology (HMCT) Course in various institutions in West Bengal. 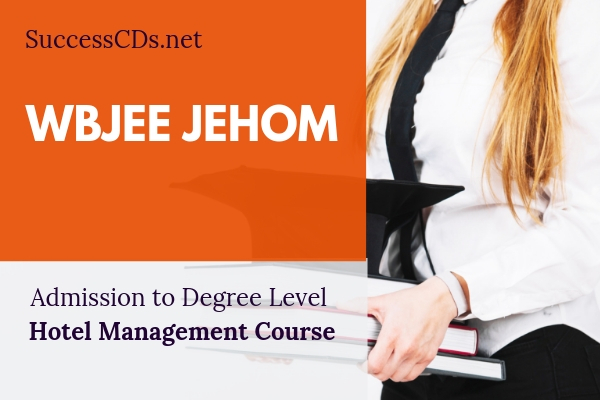 The West Bengal Joint Entrance for Hospitality Management or WB JEHOM is a yearly entrance exam conducted for admission to the undergraduate course of Hotel Management and Catering Technology (HMCT) in the institutions in the state of West Bengal. Age Limit: Not less than 17 years as on 31st December 2019. The candidate must qualify and obtain a rank in JEHOM 2018. Candidate must have passed in 10+2 level examination in regular mode from West Bengal Council of Higher Secondary Education or from any other equivalent board and obtained at least 45% marks in aggregate in 10+2 level examination. All verifications are done during counselling/admission by concerned authorities and finally by the concerned university, where registration will be done. If at any stage after exam it is found on scrutiny that the applicant is otherwise ineligible, his/her candidature shall be treated as cancelled even if he/she secured a Merit Rank in the JEHOM-2019. All the three concerned institutes taking admission in Hotel Management and Catering Technology through JEHOM-2019 being private self-financed institutes, reservation of seats is not applicable at this time. Application for the JEHOM-2019 has to be made ONLINE only through the web- portal www.wbjeeb.in. Candidates must ensure that the admit card is not mutilated/ distorted/ soiled even by accident. Candidates with such mutilated/ distorted/ soiled admit cards will not be allowed to appear in JEHOM-2019.